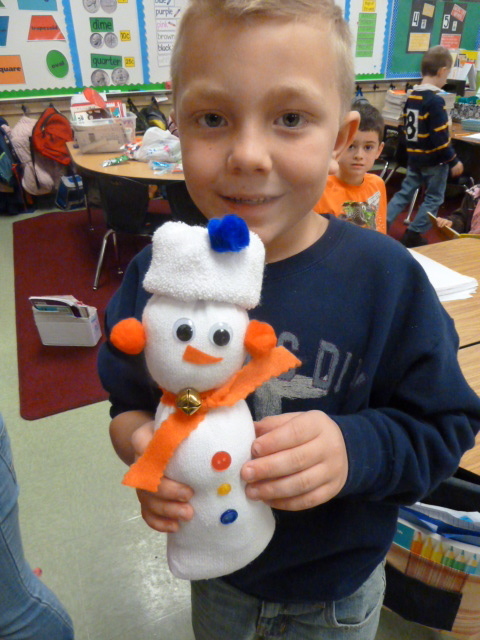 Today we made one of our parent gifts—the sock snowman! My class totally thought I was running a build a bear factory right in our room! 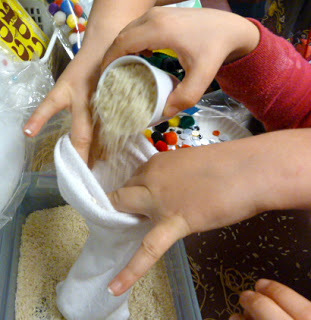 Station 1 Students put 2 dixie cups full of rice in the bottom of their sock. It gives it stability and weight for sitting up. I love feeling the rice on the bottom for some reason!!! Station 2 fill your sock up with batting. half to 2/3rds full…It’s always different student to student. I sometimes tell them to keep going or to take a little out but usually they stop in about the right spot. They pick their scarf, pom poms, & 3 buttons , eyes, nose and bell. It all goes on a little plate with their name so if you get backed up you can just stack the plates and call them over when it is their turn. Rubberband your snowman where the scarf will go and at the top of the snowman’s batting to make a head. 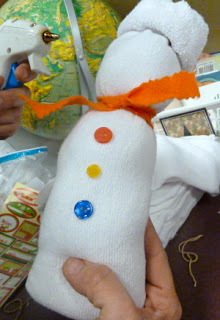 Roll down the sock to make a mock beanie on your sock snowman’s head. Glue gun the pieces on while the student ooohs and aaaahs at their new best friend at Christmas! They always have someone in mind that they can’t wait to give it to. 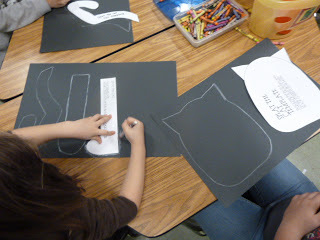 While we had our snowman factory we also made splat the cat! It kept everyone so happy and so busy! 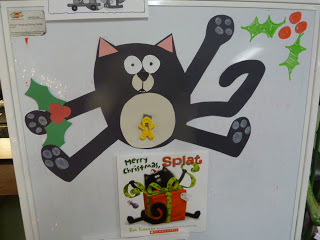 We read Merry Christmas Splat the Cat. We LOVED the part where his little sister looks at him sarcastically and says REALLY?????? I think they may have heard that from me before…just maybe. We died laughing. Ok I died laughing. Then they did too. I modeled how to trace and assemble Splat from all the templates and then I set them free to work and they were so into it! Because they were so big we set them out in the hall under our bulletin board. We got LOADS of compliments from the passersby!!! It became our little thrill of the day. A few teachers begged for the templates because their classes went nuts when they saw Splat. Two classes are making him tomorrow! That’s exciting! 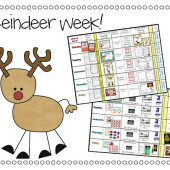 If you want Splat and a few other of my December projects click here to get it at TPT. And as one of my students said today….This is just so darn cute Mrs. Tunstall…. I wish every week could be full of art and Christmas cheer!!!! Jenn at Finally in First and Jessica at My World Made by Hand are both having Christmas Gift Linky Parties and I am linking up to share ideas and hopefully get a couple more for next year! See you there!!! OMGolly. Those snowmen are SOOOOOOOOO cute. I love the beanie the best. It just makes that snow guy perfect! What a fun and cheerful visit to your blog today. Thanks! I love those snowmen. Thanks for the step-by-step directions. I pinned it so I don't forget, too. LOVE the snowmen!! Going to Wal Mart on the way to school tomorrow!! I love everything about this post!!!! The sock snowmen are warming my heart!!! I juuuuust might have to do them during our stupid 2 1/2 day week next week!! Also I bought Merry Christmas Splat the Cat for one of my students… but it's in Spanish, so it's Feliz Navidad, Splat! FUN!!! Such cute snowmen and Splat the Cat is . . . can I say this without sounding ridiculous . . . OFF THE HOOK! 🙂 Or is it OFF THE CHAIN? Very neat snowmen. I remember making a similar one in girl scouts when I was little. 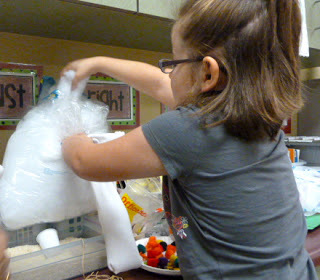 We used a roll of toilet paper for the base (bottom) and a styrofoam ball for the head inside the sock. I'm sure the kids loved them! Those snowmen are adorable! Thanks for linking up to my party. I saw those cutie pie snow people on Pinterest….adorable!!!! I bet your kids had a blast making 'em. LOVE your Splat…can't wait to add him to our upcoming craftivities…so, when are you moving to Michigan to be my new teaching buddy? Oh my goodness, HOW ADORABLE! Love 'em both! Thanks for sharing. I really enjoy your blog. I've awarded you the Sunshine Award over on mine. oh my I LOVE your little snowmen!!! I am so going to make these!! My kids love Splat! 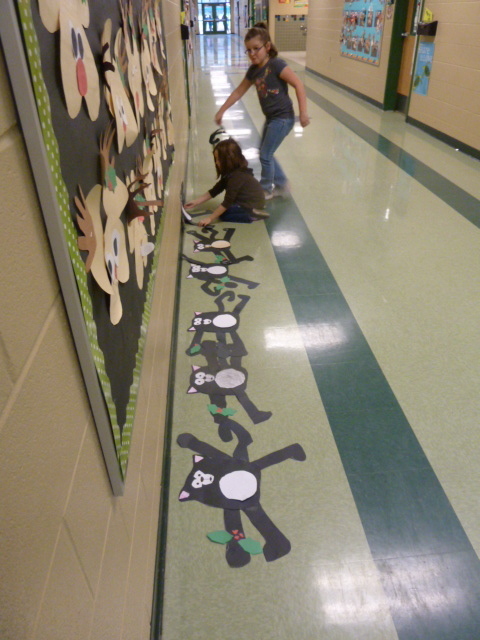 We read, "Scaredy-Cat Splat" for Halloween and it is just too cute! I might have to try this with the Halloween version next year! Love it! I love these snowmen! I teach in Austin, so my kids never get to see real snow. (It's early January and 75 degrees outside as I type this comment.) 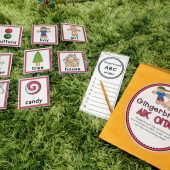 We are making these next week and then writing "how to" stories to go with the snowmen. What did you use to make the snowman mouth? Is it fabric paint or marker? Thanks for the great idea and thanks for being so generous. Reagan… your Splat is so adorable!!! We are going to have to try him out. I am so TIRED of going to Walmart, however, I must make another trip because your snowmen are darling and would be so cute with Snowmen at Night. Thanks for sharing your creative talents!! I love the snowmen! Thank you for sharing the great idea. Love these snowmen!! I'm going to try them this next month as our family gift. Thanks for sharing! I love the idea of the sock snowman. 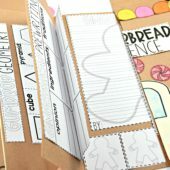 Great and easy activity for my 5 year old daughter which she made for her class project. Thanks a bunch for the wonderful idea!!! I can’t find the Cat the Splat activity on TpT. I searched and searched!